I'm a member on a website called Klout. Some of you might be on there too. Well, every now and then I get an alert that I'm eligible for something called a "Klout Perk". 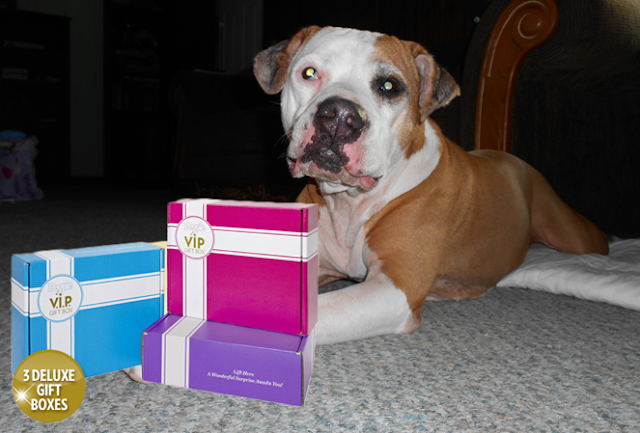 I've received some pretty cool Klout Perks before, like dog food for Shiner. That was pretty exciting. It wasn't until just the other day that I got a Klout Perk for myself! I don't get many things in the mail that are for me, can't you tell? Majority of our mail deliveries are for the dog. Excuse me human - why don't these boxes smell like food, treats, or toys? 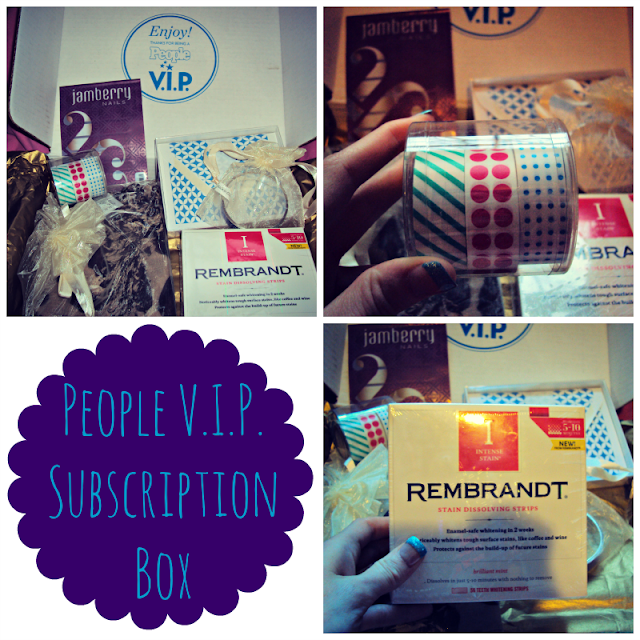 My Klout Perk is a subscription box from People Magazine. Hey, if the dog can have a nice monthly subscription box I think I'm entitled as well. Anyways, when you sign up for People VIP you can get some pretty cool stuff. 3 gift boxes filled with lots of goodies that are hand-picked by People Magazine's editors. 6 month gift subscription in print and digital for anyone you wish to give it to. People Magazine in print and digital for your computer, smartphone, and tablet for yourself. Unlimited access to some of People's apps for smartphones. Access to People Premium, which is a subscriber only section on their website with exclusive stories, perks, and giveaways. I got some nice things in my People VIP Subscription box. A scarf, a bracelet, note cards, washi tape, Rembrandt Intense Whitening Strips, and Jamberry Nail Strips. My favorites are the whitening strips and washi tape. I've been meaning to buy some teeth whitening strips lately, so these are perfect right now. And I keep hearing about this washi tape, so I can't wait to see what it's all about. I'm not super crafty, but I'm sure it will come in handy. So anyways, just wanted to share some of my goodies for a change of pace. And also say thanks to Klout for having such cool perks! *I received the products in this post at no charge. I was not asked to write anything on my blog about the products and just did it because I felt like it! Cool! I reckon that's almost as good as winning goodies from "Cat" magazine!! That's cool! Looks like some good stuff there! Wow, those perks sure do look great, Ann! It looks like it pays to have Klout! Surprise packages are always fun no matter WHAT! Very cool. I think people need treat boxes too. Haha... well you know I do have a pet rat that loves boxes! She will put it to good use. That's a good reminder that we need to get back to our klout account. We were super active but haven't been there now in like a year. Some awesome stuff you got there. It's kind of hard for me to remember to be active there also. I should probably stop by and update it actually. I've been meaning to do that lately. I'll have to check out Klout! Thanks for the info! I better get me some better Klout! Well cat food is pretty good too :) We got dog food. How cool! Enjoy your boxes! Whoa! I bet TW would like that. Thanks for stopping by and for your wishes for Milou. It is very much appreciated! Purrs! Still thinking of Milou and hoping his surgery goes well! Thanks so much for your support and good wishes for Lilly. She has her $600! We are so excited! Oh so glad to hear it Oui Oui! Yay! I got it as well and I'm trying to figure out the brand for the notecards. I want to buy more. Do you know? Thanks! I'm not sure Stephanie, sorry :( I get the impression that some of the items are kind of "generic" and perhaps produced by People or something? Like the scarf, bracelet, notecards, and tape I believe were probably just generic items.